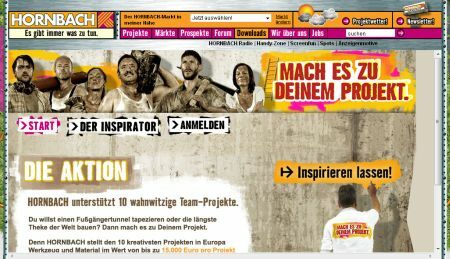 Hornbach is sponsoring ambitious DIY projects of users. While I am scanning and writing about all sorts of crowdsourcing initiatives by brands, I couldn’t help noticing a new campaign in Germany asking users to participate in a DIY contest. Guess I couldn’t miss it, since it was plastered all over spiegel.de, Germanys biggest online news source, which I happen to visit almost 10x a day. Hornbach is a German DIY store that everyone watching tool time would enjoy. They had TV spots running for quite some time, in which people completed seemingly complicated projects around the house – refurbishing bathrooms, redesigning gardens, etc. It is a logical progression to start a contest asking users for their most ambitious DIY projects. The whole setup does not convince due to originallity. There have been better ideas for contests. It excites due to size of presence. Advertising for a whole day on spiegel.de (and I guess other large sites, too) is no small deal. Also, they’re willing to sponsor up to 10 projects with up to 15k Euros per project. Also, I should add: they’re not just asking for any project, rather, they are looking for extreme, original (what’s the translation for „wahnwitzig“?) ideas. Nothing of the ordinary kind. In the contest conditions, they of course make sure that they can publish photos and names of participants, as well as reserving the right to document and publish the whole project they will sponsor. Unless they only receive applications of complete idiots, which I obviously doubt, they will have some fine material for future advertising, authentic, close to the community, relevant and most likely touching. We’ll see in a few months time, I’ll keep you posted.